I haven’t left my house in the past 7 days. Well, other than taking out the rubbish, dragging in the recycling bin from the street, and checking the post box hanging on my gate. I’ve been quite ill. Then, both of my sons picked it up. And since then, it has been a matter of making sure Brendan Bjorn, first and foremost, doesn’t end up in hospital. So far, so good, although last night I thought that is where we were headed as his fever reached 39.6C. 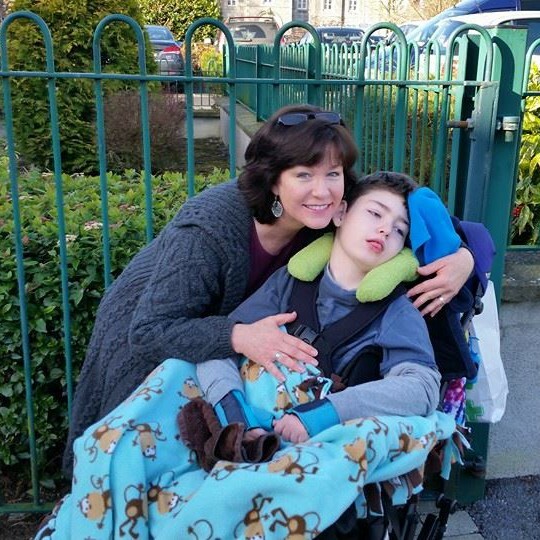 We are still home, and school is being missed, but that is better than being in hospital. 7 days stuck inside while ill gives one plenty of time to think. Caring full time for a severely disabled, medically fragile child is indeed a lot of work. I would challenge anyone to tell me otherwise. Even our elected government officials admit that the carer’s work is invaluable. But here is what I want to ask: Just HOW valuable is the work we do? The 24/7 nursing-level duties which require us to be always hyper vigilant, always ready to handle the next emergency, always monitoring…always caring. If we are to take the DCA (Domiciliary Care Allowance) figure, our work for a severely disabled child under age 16 is worth €309.50 a month. That is €3,714 a year. Now consider Carer’s Allowance, a MEANS TESTED payment for those caring full time for a disabled loved one. IF you qualify (again, this is a means tested payment, no matter the hard work you are doing as a carer), you can be eligible for up to €204 a week. That is an annual total of €10,608. So, if you get DCA and Carer’s allowance, you are paid a total of €14,322 a year to do backbreaking, 24/7, no time off, nursing-level work caring for a severely disabled child. Let’s break that down and put that annual figure into a frame of working 40 hours a week (though as I’ve said, we work 24/7, so this 40 hour a week number is beyond lacking). 40 hours per week, 52 weeks per year (because we don’t get holidays), equals 2,080 hours of work per year. Divide that into the annual “social welfare” for our hard, endless work, and you come up with €6.88 per hour. I wonder, as I look at that €6.88 per hour number, would there be a nurse in all of Ireland who would accept that rate of pay? Oh, but they mustn’t forget that, really, they will be working a 24 hour shift, not a tidy 8 hour day. Oh, and that it IS 7 days a week. Your hourly rate of pay? Yes, it did just change considering those hours. Did you catch that? But sure, you wouldn’t mind working for €1.64 per hour on a 24 hour shift, would you? Don’t forget the no holidays, no sick time off, no overtime or holiday pay differential, no scheduled 1 hour lunch break and no required 20 minute tea break every 4 hours or so. When you get a chance, yes, you can surely grab a bite to eat and make a cup of tea, just don’t expect it to be written into your work schedule. Those aren’t in this work contract. Union to protect your worker rights? Don’t be silly, now. And whatever you do, don’t even think about a retirement pension plan. There is none. You shall live day to day, on €1.64 an hour for all your work, with no security for your future. You, after all, are “just” a carer, hidden away in your home, daily charged with the most important of responsibilities – that of keeping a medically fragile, disabled child ALIVE. For that, €1.64 an hour. As I said above: 7 days stuck inside while ill gives one plenty of time to think. I know what I think. I think we deserve better. We deserve pay commensurate with the workload and work hours. We deserve to be able to afford a new accessible van when our 10 year old van begins to break down (yeah, that’s mine). We deserve to have a secure future and retirement plan with a pension. We deserve to be able to get on the property ladder, owning our own home (but can’t because no bank would ever loan to a single mum on “social welfare”). We deserve to not become disabled ourselves as we unimaginably strain our own bodies as we care for our disabled child. We deserve to not be resigned to financially existing just day to day, unable to plan for our own future, let alone for any time off. We deserve to also be able to provide for our other children, those often forgotten siblings of the disabled child, for they too are carers and they deserve the world. I dream of buying a house that I could then utilise the home modification grants. Instead, I rent, unable to make accessible modification, having to fundraise money to try and purchase an appropriate, safe ramp system into the house. Instead of having a proper wet room, I have to set my disabled son onto an unstable shower chair sitting precariously in the bath tub, lifting him in and out and carrying him from his bedroom to the bathroom and back again. I dream of being able to afford, with proper pay, trading my old van in for a newer, automatic transmission accessible van so that I can freely, without any hesitation, take my sons out into the world, as they both so deserve, without any worry or pain. Instead, we don’t drive more than is required, as the van I currently have is a manual transmission and I need surgery on my left foot which can’t possibly happen because of the many months recovery time. Carers, especially lone parent carers, simply cannot do that. So, when I drive, I drive in pain. Maybe I need to stop dreaming. Maybe I need to stop thinking so much. Maybe I just need to be quiet and keep my head down and get back to my work of caring for €1.64 per hour.